If this is the first time for a believer to go through a crushing period it can be very disconcerting. Often it causes them to doubt the validity of Christianity. Up to this point the Christian has only known the academics of the Faith; but once the actual process of testing begins it can be overwhelming. Since the spiritual diet in many Churches in America is mostly focused on the “sweet parts” of the Bible, the average believer is unprepared to face the trials all of God’s servants encountered in the Bible. Can you imagine the mind games David must have battled as he was running from Saul’s attacks? Where was God during this time? Did David wonder if the prophet Samuel misheard God when he prophesied he would be the next king? What about young Joseph when he was languishing in an Egyptian prison; didn’t God show him something different in his dreams? What about Paul being regularly beaten and imprisoned for simply preaching great sermons? The mental anguish they faced must have been immeasurable. This is where our “intellectual veil” is torn and greater access to spiritual perception and authority opens up to us. Up to this point our Christianity has been more about the adherence to the Christian religion. Now we become truly desperate for the person of God. When our formulas and memorized Scriptures don’t alleviate the torment, all we have left is God. This isn’t a loss for the believer; it is sweet deliverance from the “exalted intellect” we were cursed with during the Fall of Man. Yes this is painful, but it is God’s way of setting us free from dependence on our soul’s ability to figure things out. Through death of self we are set free. Remember, Jesus wore a crown of thorns and so must you and I if we are going to take up our cross and follow His will for our lives. 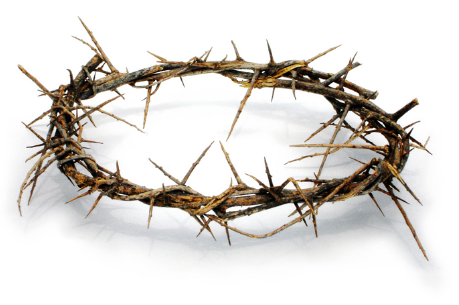 The Bible says that the soldiers twisted together a crown of thorns and put it on Jesus’ head. When we are breaking out of our dead religion or lifeless rituals, the battle to keep us in a form of godliness yet denying the power will be intense. As we wear our crown of thorns, many painful and sharp thoughts will “jab” into our head, our mind as well. These fearful thoughts will also be twisted around other legitimate thoughts making it difficult to separate them in order to make sense of them. Internal arguments arise such as; “Is this God’s will for me? Why is this stuff happening? Is this a lack of faith on my part? Should I have done something different? Do I have sin in my life? Maybe I missed God? Should I be rebuking the devil or submitting to this process?” These thoughts are so twisted together that it is difficult to unravel them to see which ones are valid and apply to your situation. We know the mental anguish Jesus suffered must have been unbearable because He actually sweat blood. We remember that Jesus was crucified at the place called “The Skull”… and this is where the battle of our lives takes place as well. The good news is Jesus wore His crown of thorns to enable us to overcome the flesh and the mind games the devil throws at us as we wear ours. This is where we identify with Christ in the fellowship of His sufferings. It is awesome to realize how deep and strong Jesus’ love for God and for us truly is. His love enabled Him to keep His mind subject to the will of God even during the anguish of the garden and the horror of crucifixion. We must not forget the Lord Jesus stated plainly that if we are going to follow Him, we must deny ourselves, take up our cross (the instrument and circumstances of our death) and then follow Him. This is serious business for the follower of Christ! Over the last several years I’ve met many Christians who were going through this breaking. When they went to their bishop, apostle, pastor or elder for support they often discovered that these leaders had no idea what they were going through. There are many in Christian ministry today who rule by their own ability and political maneuvering who simply don’t understand this process. They are really no different from the person on Wall Street or Madison Avenue trying to get ahead at any cost. When a “budding” David or a young Joseph with vision asks for help from someone in leadership, they are often misunderstood, ridiculed or even rebuked, instead of offered any encouragement. When God is taking us through Roadkill Seminary, those in positions of authority who dropped out of God’s School will see us as strange or even a threat. Get ready to duck, because there is a good chance a spear is headed our way, or watch out, our brothers might be ready to throw us into a pit! Be of good cheer, they are also part of the curriculum. Posted in Most Popular Articles and tagged Christian Maturity, Discernment, Jeff Krall, Roadkill Seminary on November 26, 2013 by Jeff Krall.